The circus continues, but perhaps the sanest moment lies in Žižek's last words, as the credits roll: “This was madness”. Most Americans are unaware of Jeju or of the U.S. policy of increasing its military presence in Korea, Japan, and the rest of the Pacific -- even moving the Marines into Australia. But for the people of Jeju, attempting to nonviolently resist the construction of a new military base, there is an eerie sense of déjà vu. In fact Jeju's history is central to how the United States became the militarized nation it has been for over half a century. 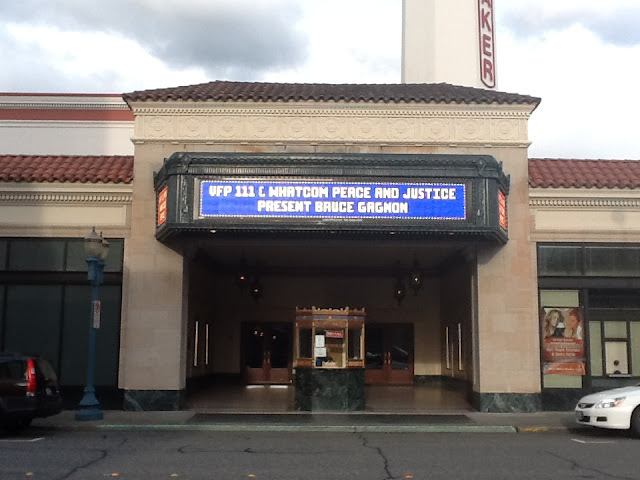 When I arrived at the Mount Baker theater last night in Bellingham I was just a bit surprised to see my name in lights flashing on the marquee. The talk was well attended and capped off a very nice visit with activists there. Old friends from Florida, John & Dorie Belisle who live just outside of town on an apple farm, came to the talk and it was exciting to see them again. They had sponsored me here some years ago when I first visited Bellingham. After the talk was over Mike Jacobsen drove me to Seattle and we arrived about 11:30 pm. I was taken to an empty house where I will be staying for three nights. I had to get up early this morning as I was scheduled to do a half-hour live radio interview on a popular local station. The host of the KEXP radio show remembered hearing me speak last time I was in Seattle and told me that when he is able to find any radio interviews I've done with other stations he likes to put them on his weekend public affairs show. It's always good to know that someone is out there paying attention. I'm washing my clothes now and preparing to get ready for a 1:00 pm talk today in nearby Redmond at Soul Food Books. Then I am off for the rest of the day. On Sunday I do my big speech here in Seattle at the University Temple United Methodist Church at 4:00 pm. This event is being sponsored by a host of local groups including the United Nations Assn, Veterans For Peace, and Ground Zero Center for Nonviolent Action. Just a note: last night I saw that Father Moon was back on the streets again in Gangjeong village on Jeju Island. A photo showed him, with cast on his broken wrist after his near tragic fall from a tetra pod, laying under a construction vehicle trying to block its entry into the Navy base construction area. I can't imagine that his three broken vertebrae are yet healed but this remarkable 71 year old Catholic priest refuses to be deterred. That is an example for all of us to follow. Mike Jacobsen went to Jeju Island for three weeks and returned one week ago. 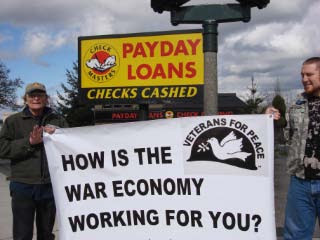 He is a member of Veterans For Peace in Bellingham, Washington. I am staying at his home while here. It's fun hearing Mike talk about his trip that came after the first three VFP members we sent over there were thrown out of the country by the South Korean government. Yesterday, soon after arriving here, Mike took me to Western Washington University where I did a late afternoon talk. From there I was taken to dinner with three other members of the local VFP chapter. This morning I was lucky to be able to go to their VFP chapter's weekly Friday morning breakfast at a local joint. 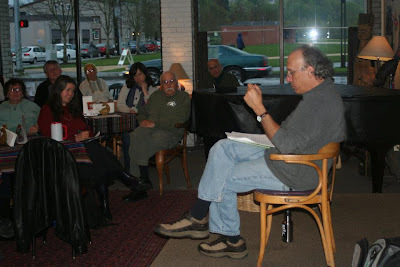 About a dozen members of the Bellingham chapter were there and we had some great discussion about endless war and organizing strategies. For lunch today we will be hosted by chapter member Gene Marx at his home. Not yet heard plans for dinner. But I am enjoying eating my way across Bellingham. I speak tonight at 7:00 pm and then Mike will drive me the two hours south back to Seattle where I will be kept busy over the following three days. The big talk here is about a proposed coal train (carrying strip mined coal) that would run from Montana and Wyoming to this part of Washington state where it would then be loaded on ships and taken to China. In Oregon and here in Washington folks are strongly opposed to the plan and are organizing to stop it. I am sitting in a coffee shop in downtown Seattle drinking English breakfast tea, a block from the Amtrak station. Leonard Eiger, from the anti-nuke group Ground Zero, is meeting me in a bit to take me to an art show by Gillchun Ko from Jeju Island who is displaying his work in a nearby gallery. Timing worked out nicely. Leonard has been one of the key organizers for my several days of events here in Seattle this weekend. But first I head to Bellingham later today where I speak at a local college at 4:00 pm and tomorrow night at 7:00 pm in a community event. My time went well yesterday in Walla Walla. Was able to speak to enviro students and show a Jeju video. Had dinner with another group of enviro students. Nice to be able to drop that "little" known fact that the Pentagon is the world's biggest polluter and has the largest carbon boot print on the planet. At my talk during the evening one environmental professor took umbrage at my critique of Obama's "pivot" into the Asia-Pacific and stated that we had to vote for him in November otherwise bad things will happen. I used that as an opportunity to introduce the story about Chicago's Crown family (big time stockholders in General Dynamics) giving the magician $500,000 in campaign donations in 2008 and additionally raising funds for him within the military industrial complex. After Obama won the election Aviation Week & Space Technology magazine reported that he got more campaign $$$ from the weapons industry than the Republican war hawk John McCain did. The magician rewarded General Dynamics by moving their Navy Aegis destroyers, outfitted with "missile defense" systems, to the head of the line as preferred options for surrounding Russia and China. One has to reward their chief donors you know. 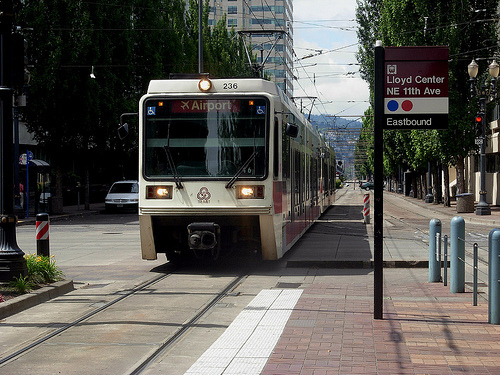 I rode the light rail system from the Seattle airport into downtown. Very smooth ride, passing cars alongside the freeway, a model for all big cities. I was up early this morning to catch a ride from Olympia, Washington to the Seattle airport where I fly to Whitman College in Walla Walla. I speak to an environmental class in the early afternoon and then have a more formal talk in the evening. Tomorrow morning I will have a very early flight back to Seattle. From there I take a train north to Bellingham where I will spend two days being hosted by Veterans For Peace. Whitman College is paying for the flight to get me out to southeastern Washington for the talk in Walla Walla. All along this trip I’ve had virtually no travel expenses – I think I’ve only had to buy one $27 train segment from Berkeley to Sacramento. Last night I spoke to a good gathering of folks at the local Traditions Café that is an institution in Olympia. The talk was video taped and will be posted on various web sites in that community and well as on cable access TV. I had a nice rest while there although last night I had a hell of a time falling to sleep after having a glass of red wine following my talk. So this morning I woke up wishing I had not had the wine or was able to stay in bed longer. I was driven to Seattle airport this morning by Glen Anderson who has maintained a weekly peace vigil in Olympia for the past 32 years. That is quite a feat. Dedication and stick-to-it-iveness for sure. I've posted this before on this blog but have found the need to watch it over and over because Yang Yoon-Mo has so much to say. He is very deep and his words are really important. He was on a hunger strike last summer for 75 days while in jail. Then more recently he was arrested again for blocking a Navy base destruction vehicle and did another 50-some day hunger strike. He is out of jail now and I heard he is being taken care of by nuns. Mainstream media struggles to talk about U.S. killing in Afghanistan. Scott Camil (Veterans For Peace) from Gainesville, Florida carries the day. 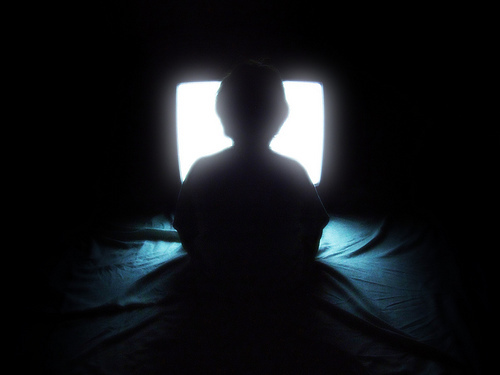 STATE SURVEILLANCE - WHAT CONSTITUTION? There is a big U.S. Navy base in Bahrain. That is why we've heard nothing from the Obama administration when it comes to defending the people there who are revolting against a monarchical dictatorship. 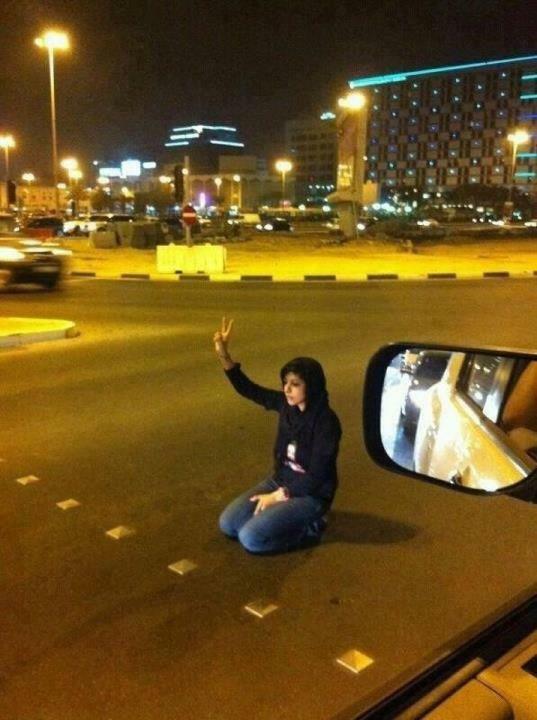 In fact it is likely that the CIA is working against the uprising. These stories keep reminding us of the presence of U.S. Naval bases. They are the tip of the spear of empire. Students have been walking around Jeju Island in support of the Gangjeong villagers. It appears to me that the numbers of Koreans from the mainland who are supporting the villagers is quickly growing. This is such good news. 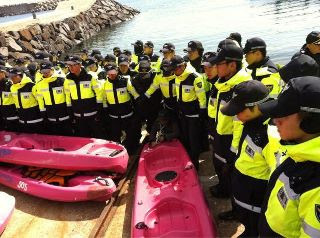 What we do around the rest of the world to help the cause will strengthen those inside of South Korea. We must join hands around Mother Earth if we hope to defeat corporate globalization and its quest for military control of all of us so it can plunder what is left of the planet. I went for an hour walk today. Holly's house overlooks an inlet of Puget Sound and it is very wooded along the road by her home. In the distance you can hear the ever present rumble of a major highway full of cars. We are still doing so little to get ourselves out of these machines even though gas prices keep rising and we know that climate change is staring us in the face. While in Oregon people told me they had more rain last month than ever before. All along this trip people are talking about crazy weather patterns. I talked with my son Julian today. He mentioned his idea of banning cars which I heard with great joy. I am so proud of the person he has become and how he is trying to integrate what he has learned in the debate world over all these years into his own life and the world as well. It's a real hard time for his generation and he understands that as well as anyone. I think the lesson for all of us is to keep reaching out and developing real community so we can help each other along the rocky path in the coming years. Going it alone (one more example of the "Business Model") ain't gonna cut it. I feel lucky to be doing what I do and I never stop thanking the great spirit for that gift. I am trying hard to give it all I have and to remember that I am doing it so that Julian, and those who come after him, have a chance for survival. There is no more important job for me - or for you. The Columbia University (New York City) protests of 1968 were among the many student demonstrations that occurred around the world in that year. The Columbia protests erupted over the spring of that year after students discovered links between the university and the institutional apparatus supporting the United States' involvement in the Vietnam War, as well as their concern over a gymnasium to be built in the nearby Morningside Park in Harlem. 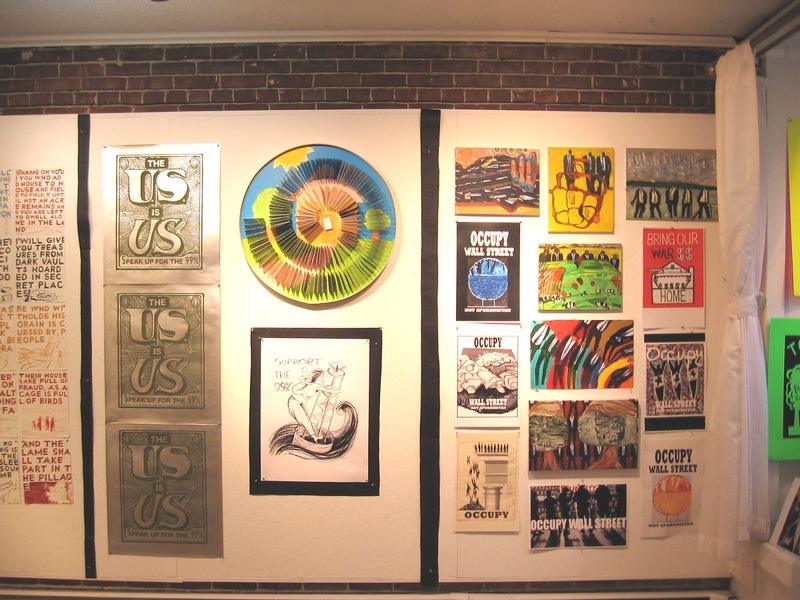 The protests resulted in the student occupation of many university buildings and their eventual violent removal by the New York City Police Department. The speech just after the 32 minute mark is particularly important for its relevance today. Post-Newsweek Stations, the broadcast division of The Washington Post Co. The E.W. Scripps Co., which owns TV stations and newspapers, including The Commercial Appeal in Memphis, Tenn. I am at Union Station in Portland, Oregon waiting for my train to Olympia, Washington. It's been a good couple of days here as my host Celeste Howard has kept me busy speaking at three different churches (two Unitarian and one Presbyterian) and at Pacific University. In addition I've done a second interview on KBOO radio and an interview on public access TV sponsored by the local chapter of Alliance for Democracy. So I feel that my message has gone out far and wide here and am grateful for the efforts made by Celeste to schedule a good mix of events. Mike Hastie, one of the three members of Veterans for Peace who we tried to send to Jeju Island but was forced to immediately return home by the South Korean authorities, came to both of my talks yesterday. In the middle of my speech, where I talk about the Navy base issue on Jeju, I asked Mike to stand and share his story. It was sad to think he was so close to reaching Jeju. He was seated on the plane going from Seoul to Jeju but was pulled off just before the plane took off. He was held in a detention center inside the airport for some time and was never given any reason for his treatment other than, "You are not welcome in Korea." 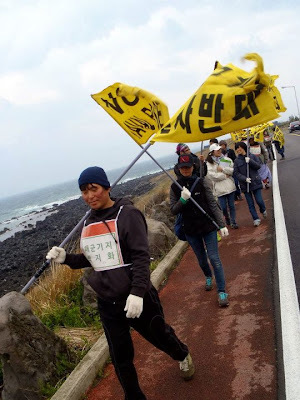 In a way though it was a supreme complement to all of those who have been working so hard to internationalize resistance to the Navy base on Jeju. They have an extensive public transit system here in Portland. Many years ago my Florida friend John Hedrick had visited here and noticed they let people ride for free in the downtown area. He brought this idea back to Orlando were I worked with him for several years organizing the People's Transit Organization that was over time successful in forcing Orlando to double their public transit funding. Since that time I've always been a devotee of mass transit - and during this speaking tour I've made special effort to compare the jobs created by investing $1 billion in building rail systems (19,675) verses spending the same amount of money on military production which creates far fewer jobs per billion dollars (8,600). That's a huge difference and I've made the case over and again that such use of our tax dollars not only would benefit labor unions, but would also help the environmental groups in a small way solve for the coming ravages of climate change and reduce the need to go to endless war for oil. The conversion of the military industrial complex is a unifying theme - a transformative demand that we should be making over and over again. I get a day off tomorrow in Olympia. I'll be staying at the home of GN board member Holly Gwinn Graham who has arranged for me to speak on April 24 at 6:30 pm inside the popular Traditions Cafe. Still another nine days to go. I am having a good time and really enjoying meeting so many great activists along the west coast. People often ask me where I find my hope and I like to tell them that one key factor is that everywhere you turn wonderful people are working hard to change things.